The post was inspired by several years of being an SDL Tridion customer, when the company was Tridion and the product was R5.x. Step-by-step guide on how to develop (and advertise) bad taste in writing CMS marketing materials, including white papers. ‘Nuf said. Long before Interwoven’s fate moved from acquisition intent to the ranks of a done deal, there were indications of changes and “cost savings” coming. Still giggle every time I think of that morning. The first big acquisition of 2009 set some folks, including me, into the pondering mode about Interwoven’s future. Since then the dust settled, some people left, products were Autonomy-zed to some degree, but it’s still fun to look at initial reactions and crystal ball gazings. CQ5 marked the end of a 3-year-long silence from Basel and Day not Communiqué-ting much aside from a couple of point releases. The world was agonizing in anticipation of what the R&D-focused vendor came up with. I got a chance to install the product and poke around. Just like in marriage, the expense doesn’t stop at a Vera Wang dress. Or, even earlier, at a short-list. About this time last year, Vignette let some of its people go (was it à la Moses act of freeing?) in preps for prettifying itself for the Open Text acquisition. This one is only vaguely CMS-related, infectious as all memes, yet curable. The real #1 of this top 10 list was actually the about me page. Go figure. Blogging is easy, usually free, and most importantly, fun! Now, I am not perfect (well, am nearly 😉 ) and could use more self-blogging discipline, but whoever wrote that statement must’ve never blogged a single line in his/her life. It sure is ain’t that easy (Oh, yeah, after all, I live in the South). Open Text unveiled its 2010 product roadmap at Open Text Content World in Orlando, highlighting many rebranding changes that are to come, including those for RedDot/Web Solutions and Vignette. The community still doesn’t appear to be appeased. But business is business. In the meantime, I am revisiting Shakespeare’s Hamlet in preparation for my next piece on Open Text planned for early January 2010. Open Text appeared in the news again with the announcement on expanding its ECM solutions portfolio for Oracle. IBM continued to focus on analytics as a way of better management of unstructured and structured content. OmniUpdate continued to work the hi-ed crowd with new version 8.10 featuring multi-lingual and multi-output previews. Sitecore v6.2 saw the light of day (I, personally, wasn’t much impressed) and took a bite of online engagement and social communities through Telligent Community integration. Ektron’s “big guns,” including the newest addition to the team Tom Wentworth, previously of Interwoven, showed off the new version 8 of CMS400.NET (yes, the one that was inelegantly leaked some time before the official release). Nstein walked me through their “New Kind of Site Search” with 3S (Semantic Site Search), interesting ideas there with multi-index federated search, embedded Text Mining Engine, semantic widgets and a more flexible presentation layer. CMS Watch sliced and diced the market in its Web CMS Report 2010. EPiServer entered into a partnership with Mediachase in order to add eCommerce capabilities to its Web CMS and Relate+ community platform offerings. Web publishing vendor WoodWing turned to celum for a DAM integration. Jarrod Gingras and Peter Sejersen’s look into the pitfalls and best practices of selecting a CMS. McBoof, Janus Boye, et al’s attempt to #fixwcm, while heatedly debating some of the inconvenient truths and challenges of the content management industry. David Nuesheler’s of Day Software session on top 8 trends in web content management architecture and standards (CMIS, JCR 2.0, JSR-283). BJ Fogg’s preso on “hot triggers,” “cold triggers,” persuasive technology and why Twitter and Facebook are winning. A myriad of fantastic, thought-provoking, brain-activity-inducing conversations in hallways, at dining tables, at social events, while braving the rain and the cold – you know who you are. PS: I miss Århus. Thanks, Janus! Content migration, the dirty little secret of content management, where content migration challenges, stumbling blocks and techniques to avoid them were discussed. One of the simplest, yet most often overlooked takeaways: Know your content. One of the hottest topics of the event – open source and its rise in content management. One little tidbit of info signaling a broader acceptance of open source even just looking at Gilbane — there were virtually no OSS vendors here 4 years ago. This year, there were 6. PS: Great fun seeing/meeting the usual CMS crowd suspects IRL and chatting about royal matters of the content management kingdom 🙂 Thanks, Frank! Hippo held its ForgeFriday as planned (read event recap here from Tjeerd Brenninkmeijer) and released Hippo CMS 7.2 aiming to deliver more TLC to end-users with several Hippo Site Toolkit (HST) treats. Bill Beardslee called to say he moved to Miami and left Percussion for dotCMS. And soon after, dotCMS announced its intent to embrace CMIS. Nuxeo now has their very own DAM system in addition to the existing ECM and DM products — all tightly knit together. Another first is their international user conference planned for March 2010 – NuxeoWorld. Magnolia CMS concentrated on hierarchical content modeling and interoperability (still based on the JSR-170 standard) in version 4.2. Alfresco started offering an option for fault-tolerant, load-balanced, complex configuration deployments of its ECM product in the cloud with help from RightScale. The CIA continued its investment in open source and technology and got more visibility into social media (=open source = data in public domain) after giving some $$$ to the social media monitoring firm Visible Technologies. Any social content (open or hidden) can be scraped, scored and displayed in a nice dashboard. Gotta admit, I am about to run out of the (semi-) witty headlines for Day Software that continues to build on the momentum and report bright financial results quarter after quarter. That is, let’s not forget, following the not-so-bright period a bit of time ago. After reviewing and changing their accounting policies, doing a bit of a re-org in the upper echelons and shedding some extra weight, Day continues to deliver positive numbers in Q3 2009. The highlight of Q3 (interim results) is a considerable increase in license revenue — a 37% growth over the same period in 2008 and a 26% increase over 1H 2009. Day attributes these revenue numbers to “global demand for CQ5” and “major new customer wins.” I’ve looked at both CQ5.1 and CQ5.2, as they came out, and do tend to agree that the product is starting to look more and more compelling. These were interim Q3 results. Not many details are available, but chances are R&D (and associated sales and marketing, etc.) spendings are sky-rocketing to get the upcoming CQ 5.3 to the market. Day to Ignite CQ5 CMS Discussions in Europe and U.S.
Day’s customer? Evaluating Day CQ5 CMS? 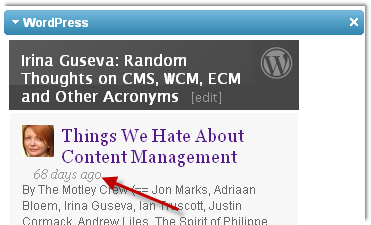 CMS geek generally curious about the present and the future of web content management? Check out Day’s customer summit that is scheduled to take place in Zürich (October 14-15, 2009) and Chicago (October 28-29, 2009). Day’s plan for this event is, mainly, to share strategies and customer stories around CQ5 Web CMS that was released in November 2008. CQ5.2 that came out earlier this year included new DAM and Social Collaboration features. There are several tracks planned at the summit, including business and technical. The business track is focused on CMS project objectives, CQ5 selection and criteria, and CQ5 business results. In the technical track, attendees will look into CMS project objectives and implementation plan, CQ5 deployment details, and lessons learned in best leveraging Day’s CQ5. Very often, it’s best to get right into the vendor’s camp if you want to get more insight into what’s going on with the company and where it is going. While, as we reported, Day has had many good days lately, nothing beats a chance of being able to talk to the actual customer who had already put a check mark next to that line that says “CMS implementation.” Getting direct access to Day’s management and technical teams wouldn’t hurt either. A bit of gazing into the crystal ball is also on the menu with one of Gartner’s analysts leading a discussion on where Day and the content management industry are headed in 2010. Cherry on top: Day’s CTO David Nüscheler will give a sneak peek of the upcoming CQ5.3. Now, that should be interesting. Day’s customer? Evaluating Day CQ5 CMS? CMS geek generally curious about the present and future of web content management? Check out Day’s (news, site) customer summit that is scheduled to take place in Zurich (October 14-15, 2009) and Chicago (October 28-29, 2009). Day’s plan for this event is, mainly, to share strategies and customer stories around CQ5 Web CMS that was released in November 2008. CQ5.2 CMS that we saw earlier this year included new DAM and Social Collaboration features. There are several tracks planned, including business and technical. The business track is focused on CMS project objectives, CQ5 selection and criteria, and CQ5 business results. In the technical track, attendees will look into CMS project objectives and implementation plan, CQ5 deployment details, and lessons learned in best leveraging Day’s CQ5. Very often, it’s best to get into the vendor’s camp if you want to get more insight into what’s going on with the company and where it is going. While, as we reported, Day has seen many good days lately, nothing beats a chance of being able to talk to the actual customer who had already put a check mark next to that line that says “CMS implementation.” Getting direct access to Day’s management and technical teams wouldn’t hurt either. Cherry on top: Day’s CTO David Nuescheler will give a sneak peek into the upcoming CQ5.3. Back in April 2009, when Day announced the nominations of Barry Bycoff and David Arnott to the Board of Directors. Both were elected in May at Day’s Annual Shareholder meeting in Basel, Switzerland. Today, board member Barry Bycoff was elected the Board’s Chairman, replacing Michael Moppert, the founder of Day. Moppert assumed the Chairman role in May 2008, after he handed off his Day CEO reigns to a former Interwoven exec Erik Hansen. Moppert is said to remain an active member of Day’s Board. Bycoff took over the steering wheel on a good day, shortly after Day’s announcement of positive 1H 2009 financial results. “I am pleased to be working with Day’s CEO Erik Hansen and the remainder of the Board to help Day capitalize on this opportunity and build on its recent success,” said Bycoff. Hansen’s initial plan to make Day more appealing seems to be working out so far. Upon accepting the CEO role, he wanted to focus on growing Day’s strongest points: the content infrastructure business and the core content management product. Since then, we’ve seen CRX new releases and updates, as well as new versions of Web CMS CQ5 and CQ5.2, hit the streets of the content management world. Looks like the WCM market , and the new and existing Day’s customers, are mostly positive about the product as well, as they keep investing in this Web CMS and making Day’s 2009 first half numbers shine brightly yet again. 1H 2009 revenue growth was reported at CHF 17.0M, which is an increase of 33% from total revenue of CHF 12.8M for 1H 2008. License revenue accounted for a whopping 42% of total revenue at CHF 7.2M, an increase of 26% from total license revenue of CHF 5.8M compared to same time last year. According to Day, there is an increase in re-orders from the existing installed base due to the interest in updates and new modules that came out in CQ 5.2 (e.g. DAM and Social Collaboration). Support and maintenance revenues came in at CHF 5.4M, or 32% of total revenue. Day also reported operating income of CHF 1.8M, or 11% of revenue, and better-than-expected GAAP net income of CHF 1.1M, or 6% of revenue. Total cash was CHF 18.3M, a 21% increase over 1H 2008. Day’s success in the challenging economy is partially due to the operational restructuring efforts that took place last and this year, along with key new hires and additions of new members to its Board of Directors. We should see more R&D, sales and marketing investments at Day in the second half of 2009. If you wish to geek out on accounting numbers, head over here. I, in the meantime, cannot wait to get my hands on the next release — CQ 5.3. As a follow-up on my chat with Day’s David Nüscheler about Chemistry, here’s a very insightful interview with another major Chemistry contributor — open source ECM vendor Nuxeo via Florent Guillaume, head of R&D.